A well-planned peer buddy program can play a critical role in making inclusion happen, promoting social interactions and friendships, and creating communities where all students help each other learn. 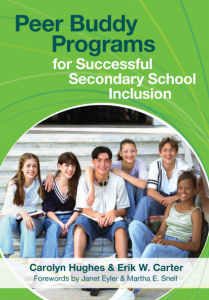 Today I’d like to welcome an expert who knows the secrets to successful peer buddy programs: Carolyn Hughes, co-author of the terrific planning guide Peer Buddy Programs for Successful Secondary School Inclusion. Carolyn’s here to answer some key questions about peer buddy programs: how they benefit students, how to get one started, how to generate student interest, and more. Q. How do peer buddy programs benefit students with and without disabilities? Q. If a school wants to get a peer buddy program started but isn’t sure how, what are some first steps they should take? A. [Co-author Erik Carter and I] have developed a seven-step process for starting a credit-based peer buddy program. The starting point is a conversation with administrators about the logistics of and steps in starting a new course that allows peer buddies to spend at least one period each day with students with disabilities (Step 1). The next step is to establish course expectations and recruit peer buddies to join the program (Step 2). Third, potential peer buddies should be screened for good attendance and interest and matched with students with disabilities based on similar interests and class schedules (Step 3). Next, peer buddies are oriented to their new support roles and provided with suggestions for communicating and modifying activities (Step 4). As students continue to interact with each other, it is critical to assess the extent to which the program is accomplishing its intended goals (Step 5) and, if desired, to expand the program by encouraging new students to participate (Step 6). Finally, an advisory board can be established to provide support, feedback, and guidance (Step 7). Q. What would you say to an educator or school administrator who says “I’d like to start a peer buddy program, but we just don’t have time”? A. Starting a peer buddy program may seem overwhelming to educators or administrators. However, it’s fine to start “small” by matching peers and students with disabilities in just one or two classes. Or educators may initiate informal strategies to promote interaction, such as inviting peers to join students with disabilities for lunch in the cafeteria or at sporting events or other extra-curricular activities. In general, educators and administrators are likely to be pleasantly surprised to learn that peer buddies actually are efficient helpers in the classroom and lighten a teacher’s load by supporting their partners with disabilities. In addition, once a peer buddy program is established, participating students will recruit new peer buddies on their own. Q. What are some hallmarks of an effective peer buddy program? Can you identify some traits/qualities that the most successful programs have in common? A. Peer buddy programs are designed to promote positive educational outcomes for all students. Characteristics of successful programs include (a) students with disabilities participating in the full spectrum of activities that comprise a typical school day, (b) active participation by students with disabilities in their general education classes, (c) students’ progress on their IEP goals, and (d) positive feedback from all participants–teachers, staff, and students–with respect to their experiences in the program. Q. What are some ways to generate student interest in peer buddy program participation? A. Many students who are motivated to participate in peer buddy programs have already had experience interacting with people with disabilities through school programs, summer camps, after-school programs, co-workers, family members, or friends. Some may be interested in supplementing these experiences during the school day. Others may be interested in pursuing a career in education or may be looking for a service-learning experience that presents new challenges and opportunities. During the first year of a program, school personnel will need to actively recruit peer buddies through school announcements, posters, notices in the school newspaper, and speaking in school clubs and classes. After that, participating peer buddies will be helpful by recruiting their friends to join the program. Q. If you’re an educator interested in starting a peer buddy program, how can you go about getting the support of your administration? A. Because there are so many issues vying for the attention of administrators, it is important to assure administrators that investing time and resources in a peer buddy program is worthwhile. Explaining the potential benefits of peer buddy programs for all participants can help administrators realize that their efforts would be well spent. These benefits include (a) enhancing educational outcomes for all students, (b) supporting teachers and administrators in responding to school reform efforts, (c) promoting inclusive practices for all students, and (d) building a cohesive and cooperative school community. Q. How should schools assess and monitor peer buddy programs to ensure that they’re working? A. 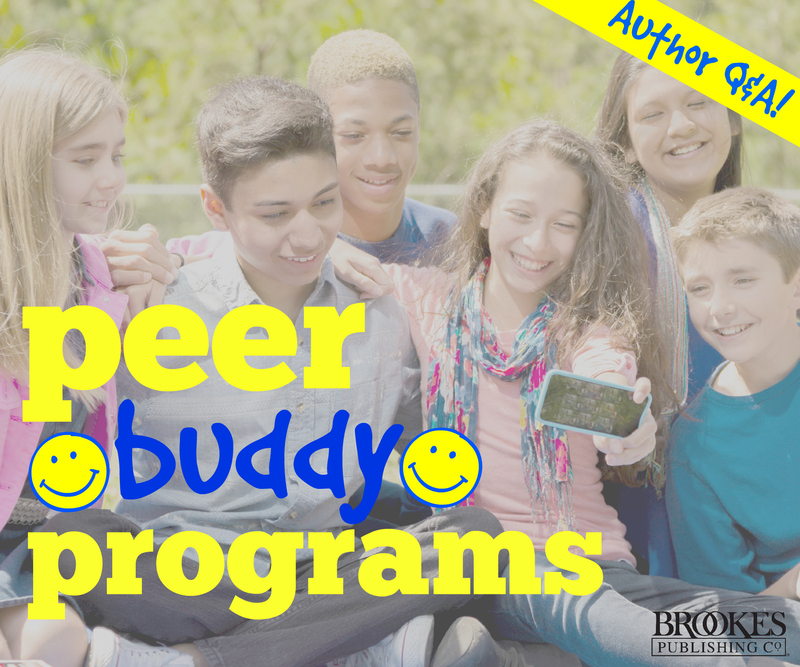 Multiple strategies should be used to assess and monitor peer buddy programs. Educators can schedule observations and feedback sessions with peer buddies to provide suggestions and address peer buddies’ questions or concerns. Peer buddies can keep daily journals of their activities and reflections, which can be reviewed weekly with classroom teachers. Establishing peer buddy clubs allows peers to share experiences and ideas and gives teachers opportunities to offer ongoing training and feedback. Conversations with students with disabilities and their peers can reveal much information about what is working in a peer buddy program and allow suggestions for change, as needed. Educators can also develop advisory boards that include students (peer buddies and their partners), students’ parents, participating general and special education teachers, administrators, and guidance counselors to provide evaluation of a program and suggestions for improvement. Thanks to Carolyn for being here today! For specific guidance on how to implement a peer buddy program in your school, be sure to check out the book she wrote with Erik Carter. Do you have experience with a peer buddy program in your school? Submit your success story–we’d love to hear from you!